In Hawthorne, lethal weapons have become objects d’art. In Hawthorne people were already buying red, white and blue petunias to plant in their gardens for the Armed Forces Day celebration, always held on the 3rd weekend in May. Hawthorne is Nevada’s Mayberry, comfortable and drowsy (except when the wind is blowing 90 mph), but it bristles with guns, bombs and missiles in the big Armed Forces Day Parade. Hawthorne has been home to the military ammunition dump since Lake Denmark New Jersey blew up in 1926. First operated by the Navy, and then by the Army, it’s now a civilian-managed concern operated by Zimmerman & Day. 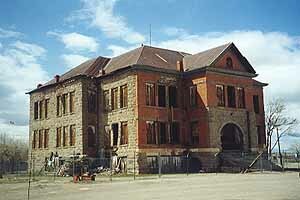 The last recorded explosion here was in the early 1990s when one of the bunkers went up after a summer thunderstorm. 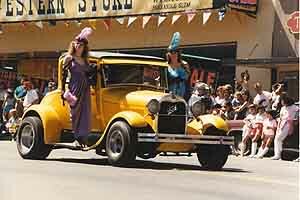 The 34th annual Jim Butler Days, on Memorial Day Weekend, is Tonopah’s signature event. For details call 775-482-3859. Tonopah is pleased as punch about the Mizpah Hotel coming back to life, but the opening date is uncertain as the entanglement from bankruptcy proceeds. Nevertheless it is clear that new owners are intent on bringing the old hotel back in the high style intended by Frank Scott. Scott was the Las Vegas builder who fell in love with the old hotel as a kid. He bought and restored the old hotel in 1979, only to see it rushed to open before it was completed on account of a mining boom that overtook the old city. Lester O’Shea built a free-standing elevator shaft behind the Goldfield Hotel when he attempted restoration in the 1980s, but it’s unlikely there’s an elevator in it. The original elevator is still in place too. Lots of restoration activity in Goldfield, but none visible at the hotel yet, despite an optimistic new owner last summer. I whizzed through Beatty too quickly to notice much except the new paint on the Beatty Club. 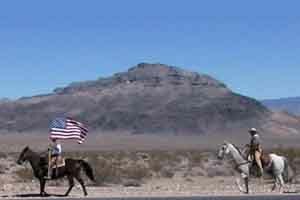 The Pony Express didn’t pass near Pahrump, but that doesn’t discourage modern riders from recreating it anyhow. An April morning in Pahrump and the breeze is stiff and crisp from the northwest. Palms are trembling and waving their fronds, flags snap straight out from their lanyards, and the mountains to the west stand sharp and stark against the sky. Who wouldn’t like it? But during the morning the wind increases, and by noon it is daunting, with sand blowing in the air and doors blocked against it. Overton is a great place to sleep. From Pahrump I drove to Overton. Big change, from bustling boom town to quiet village. 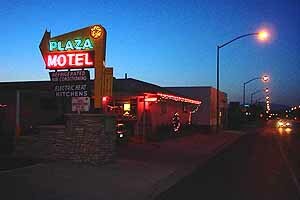 Overton is a great place to sleep, and you can choose from the restored classic Plaza Motel on Main Street or the Best Western on the north end of town. Overton is also home to the intriguing Lost City Museum, with its recreated Anasazi pueblo to explore. 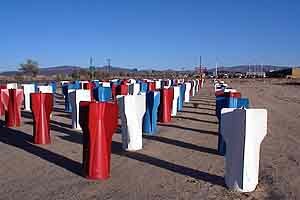 Overton to Pioche is another big change, from lowland farm town to a silver mining town in the mountains. Along the way US 93 passes through the lush Pahranagat Valley with its beautiful lakes, one of Nevada’s most beautiful spots, and in the mid-19th century a favorite pastureland for horse thieves from four states and territories. 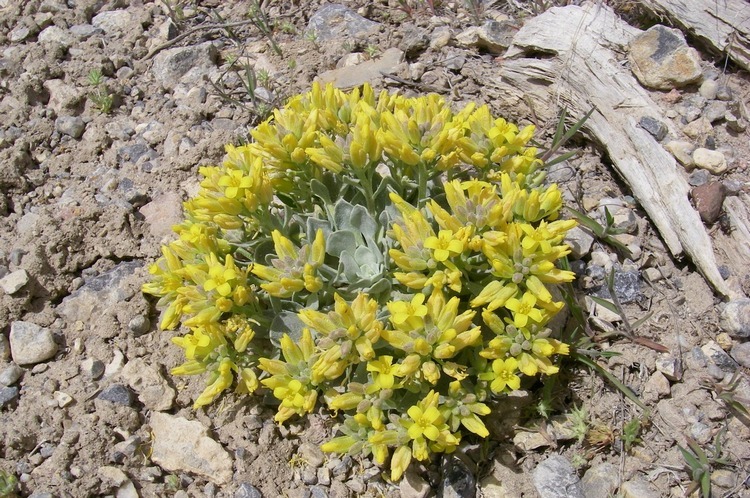 In 1935, Cathedral Gorge became one of Nevada’s first four state parks. 22 campsites with tables, grills and shade ramadas. Water and a flush restroom with showers available. Caliente is so different without the railroad switching yard in the center of town — not only is it quiet, but the two business blocks now have a clear view of one another. The transformation of this remote hamlet into another Sun Valley was planned but never consummated, but it attracts many summertime visitors to the state parks in the vicinity. 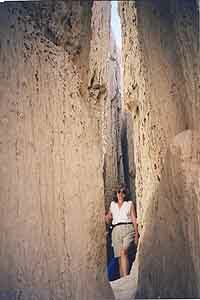 Cathedral Gorge in particular is a unique attraction and popular destination. What separates this smallish wash from countless others in this wild country is that its walls are made of a chalk-soft suede-textured tan bentonite clay which has eroded into a fantasyland of intricate shapes. Cathedrals, yes, and wedding cakes; fortresses and hunchback men; pillars and dragons; palaces and melting elephants; baroque architectural creations and structures as yet undreamed of — lacy, filigreed, fluted and feathered. A Visitor Center at the entrance to the park is open from 9 to 4 daily. Next time, the rest of the journey: Pioche, Baker, Ely, Eureka and Austin. Weird celebrity sighting: No, it’s not Melvin Dummar again, it’s Courtney Love, the diva of grunge. She was spotted at Harvey’s Lake Tahoe the other day and I’ll bet you can’t guess what she was doing. No, no, and no — She was conducting weddings, as in “With the power vested in me. . . .” and when she was done, 22 couples of the traditional male-female configuration had been converted from single to married. But why? The folks at Harvey’s are just as baffled as you and I. 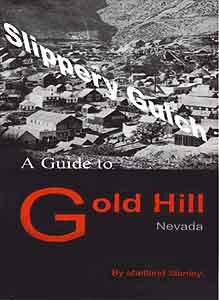 In my Bookbag: Slippery Gulch: A Guide to Gold Hill Nevadaby Maitland Stanley. Mat Stanley was the freight manager for SwissAir in San Francisco when he and his wife Peggy visited the Comstock Lode and Mat got curious about Gold Hill, Virginia City’s down canyon neighbor where the first gold discovery was made in February, 1859. Since then — his visit, that is, not 1859 — Mat has devoted his considerable energy (and some of Peggy’s too) in satisfying his curiosity, and in the process has become the world’s greatest expert on this historic community. Although it might seem to play second fiddle to Virginia City today, in the early years Gold Hill was a major city in its own right. “The central business district was densest between the present-day Gold Hill Hotel and the [Virginia & Truckee Railroad] depot. Saloons, restaurants, barber shops, breweries, hardware stores, stables, hostelries, tailors, bootmakers, doctors, lawyers and brokers offices, banks, grocers, butchers and various other businesses lined both sides of the steeply-angled main street, cordoned by myriads of stairs.” Gold Hill flourished in great shudders from 1859 to about 1880 and is now at a low ebb compared to those early times. Stanley illustrates his detailed information with dozens of historic and contemporary photos, maps and ephemera, making it a very rich feast and a very tasty addition to the literature of the Comstock Lode. Available from Mark Twain Books in Virginia City, at the Gold Hill Hotel and at our online Nevada Book Store.